Polar bears are classified as marine mammals due to the fact that they spend much of their lives on Arctic sea ice and a considerable amount of time swimming. Polar bears have evolved to be uniquely suited for life in the Arctic. Their water-repellent coat is thicker than any other species, with fur covering even their feet for warmth and traction on ice. A thick layer of blubber provides additional insulation as well as buoyancy in the water. With large, flat, oar-like feet, polar bears are excellent swimmers. Although they have been spotted swimming in open Arctic waters as far as 200 miles from land, swimming long distances is not preferred, as it requires a tremendous amount of energy for adults and can be fatal to young bears. Population: The World Conservation Union (IUCN) estimates that there are between 20,000-25,000 polar bears in the world. In the biologically rich Arctic, polar bears sit at the top of the food chain. Polar bears feed almost exclusively on the fat of ice-dependent seals. Because polar bears cannot outswim seal, they hunt their prey on land. The most important habitats for polar bears are the edges of pack ice where ice is continually melting and refreezing. This process creates open spaces in the ocean (between sea and ice) where polar bears can hunt seal that come up for air. Polar bears are only found in the Arctic. There are 19 different subpopulations, scattered across the northern edge of the U.S., Canada, Greenland, Norway, and Russia, four of which are in decline. The Beaufort Sea region is arguably the most studied and polar bears in this region have fallen 40 percent in the last ten years. What are the primary causes of Polar Bear decline? Put simply, Arctic ice is melting and this is making hunting increasingly difficult for polar bears. 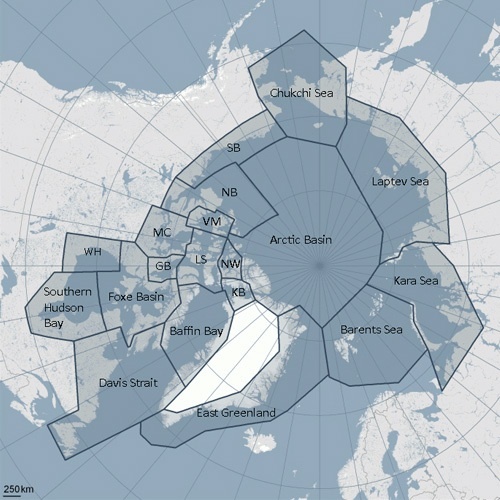 According to National Geographic, “Even today, in the middle of the bitter cold Arctic winter, satellites show there is about 770,000 square miles less sea ice than the 1981 to 2010 median", an area larger than Alaska and California combined. As a result of global climate change, ice is melting sooner in the spring and forming later in the fall, forcing bears travel great distances to find solid ground to hunt. Polar bears aren’t built for walking long distances. They can lose weight very quickly but also gain it back just as fast if they can catch enough food. Although capable of swimming long distances, polar bears burn far more energy swimming than walking. The greater the distance the bears have to travel to reach the ice to hunt, the more weight they lose, eventually losing muscle, further decreasing their chances of hunting success, leading to a downward spiral.
. The Arctic is warming twice as rapidly as the global average, diminishing the sea ice that polar bears rely upon for food and forcing many to embark from water on to land where they desperately forage for goose eggs or rubbish from bins in far-flung towns. Thank you for teaching people more about polar bears and why they are endangered. When people read this they will understand what’s happening to polar bears and what they can do to help them. Great read! I learned a lot about Polar Bears here. I honestly love them so much.